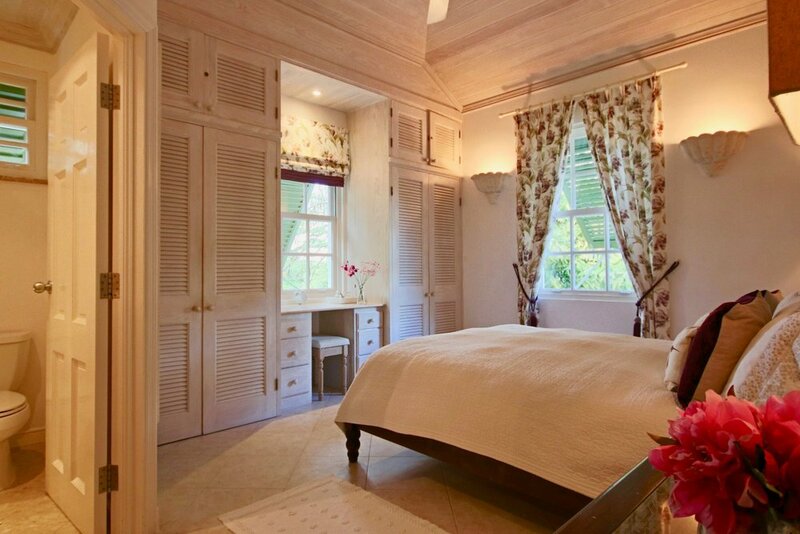 Looking for a Barbados villa holiday? Ocean View is a luxury 2 bedroom apartment overlooking the beach at Mullins Bay on the Platinum Coast. The apartment is very well appointed with two double aspect bedrooms, a stylish kitchen and comfortable living room. There are wonderful views from the terrace. The bright and spacious living room is beautifully furnished with comfortable rattan sofas and plush cushions. Double doors open on to the large terrace with the ocean view beyond. Satellite TV, DVD player, free Wi-Fi access. Indoor dining table for four. The kitchen is modern and clean and fully equipped with everything you could need for your stay - right down to the espresso machine! There's a huge American-style fridge/freezer for the local beers and ice cream, a full oven and hob, a microwave and a dishwasher. There are laundry facilities too. Fully equipped from toaster to corkscrew. American fridge/freezer with ice dispenser. Dishwasher, microwave, conventional oven and hob, washing and drying machines. The second bedroom is a dual aspect room with views to the ocean side of the apartment. The room has twin beds, is fully air conditioned and has plenty of wardrobe space. The family bathroom is adjacent although not en-suite. Air conditioning in second bedroom. The large terrace is open on two sides, making it feel particularly spacious. Tropical plants from the gardens below create the foreground for a wonderful view of the ocean at Mullins Bay beyond. Comfortable sofa for relaxing outside. Stylish table and 4 chairs for dining al fresco. The main bedroom is a dual aspect room with a wonderful, high ceiling and the convenience of a modern en-suite shower room. The room is fully air conditioned and features a (really comfortable) king-size double bed. There is a dressing table and plenty of wardrobe space. A hairdryer is provided. Air conditioning in master bedroom. King-size double bed with comfortable mattress. Beacon Hill is a small gated community, set in beautifully landscaped tropical gardens. There is an inviting, shared pool and jacuzzi adjacent to the apartment. This is shared with just 5 other apartments and is never busy. There are loungers provided for sun worshipers and a shady retreat under the gazebo for escaping the midday heat. Large shared pool (unheated but always warm!) and jacuzzi. Gated community with reserved parking. Path to the beach through coded access gate. Sleeps: Up to 4 in 2 bedrooms (one double, one twin). Nearest beach: Mullins beach, just across the road (a few steps away). Access: Car advised (although there are bus stops by the beach). Basic provisions 100 metres. Keeping in touch: Free Wi-Fi (Superfast Fibre connection up to 150 Mbps) with Internet TV, DVD player and Apple TV with Netflix. The team: Welcome from our property manager, Ann and looked after by our housekeeper, Kathy who visits 3 times per week. Optional services: We can arrange airport transfers and can even arrange for local chef, Lionel to prepare some of your meals. Would suit: Ideal for families of all ages. Not suitable for people with restricted mobility (due to steps). Please note: This is a No Smoking property. Sorry, no pets allowed. Opposite: Mullins beach with sun beds available to rent; excellent for swimming, water sports and long walks before breakfast. Try: Bombas Beach Bar, a short stroll north of the beach for reasonably-priced food which is always full of flavour. Holetown: is just 10 minutes by car to the south and has many fine restaurants, a supermarket (featuring Waitrose products) and the Limegrove shopping complex. Speightstown: is 5 minutes to the north and also has a supermarket, banks and many excellent bards and restaurants.